Visitors ask questions about male cats and their kittens. I have a pregnant kitty at home. The father of the kittens is also our cat and both are inside cats. I've have had lots of pregnant kitties in the past, but it was always because they went outside and found a random tom to mate with. My question is if it's okay for the father of the kittens to interact with them after they are born, or could he potentially hurt them? He's been very affectionate towards the momma kitty so far, which is super adorable. Kitty romance, hehe. I'm not sure how he would act around the babies. I would really appreciate your help. Thanks so much. Congratulations on your upcoming kittens. I'm sure they'll be adorable. It's unlikely that your cat would hurt his own kittens. 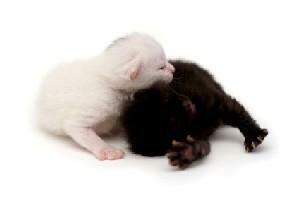 Cats sometimes will kill the kittens of other males, just like big cats do in the wild. However, some mother cats are very nervous when males come around and have been known to even turn on their own babies. There's also the off chance that your male would kill the kittens so your female comes back into breeding condition much sooner. I would try to keep them separated until the kittens are a little older, just to be on the safe side. Either that, or make sure that you are monitoring them very closely when they are together, and separate them when you won't be there to supervise. I hope that answers your question. Good luck!